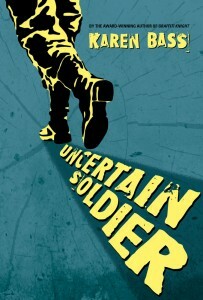 Uncertain Soldier by Karen Bass has been shortlisted for the 2016 National Chapter of Canada IODE Violet Downey Book Award. This award is offered annually for the best children’s English book containing at least 500 words of text. The winner will be announced at IODE Canada’s 116th National Annual Meeting being held at the Lambton Golf and Country Club, Toronto, on May 27th, 2016. IODE Canada is a national women’s charitable organization dedicated to enhancing the quality of life for individuals through education support, community service, and citizenship programs. You can learn more at the IODE website. Uncertain Soldier, a suspenseful YA novel about a WWII prisoner of war struggling with conflicting loyalties, has also been nominated for the Forest of Reading Red Maple Award.